As much as I care about my health and diet I cannot resist a viscious treat especially if it's good. I believe that we aren't meant to go through our existence without having a little indulgence here and there. It would not be worth going through life's pitfalls if we were only meant to suffer. As a matter of fact if it were not for the very gratifying and comforting pleasures of life we would surely not stay on the boat for so long. It would be a pretty tough ride otherwise. Everybody needs an encouraging reward now and then. And if I go to Hell for thinking or behaving hedonistically, I don't mind as I'm 100% sure it is full of epicureans as all the sad and bitter people end up in Heaven!!! Anyway, now that the weather and Nature's look are autmnal I am really starting to crave chocolaty desserts and "dirty" baked goods. So, the other day I got the idea to make brownies that would be original and diabolically droolworthy. For that I inspired myself from Alice Medrich's "Bittersweet Brownies" (this recipe can be found in her "Pure Desserts" cookbook) and created a totally new recipe that came out of my airy-fairy imagination. As I had been meaning to try confectioning a sweet goodie with bacon since quite a while I thought that it would be awesome if I added that visciously delicious and crispy charcuterie to my brownies. In order to counter balance the round and exhalirating aromas of smoked bacon I also used 72% dark chocolate, Turkish coffee (not the brewed version but the fine coffee powder), pure vanilla bean paste from Australia and pink salt from Himalaya. In my opinion, real Brownies that make make you drool incontrolably and have that oomph quality to them have to be super fudgy, moist, chewy, sludgy, dense, full of character, ever so slightly "cakey", intensely flavorful and mindblowingly calorific. If they are not in this way, then there's no fun and they are then granny chocolate cakes (I don't mean to insult grannies, though) and that's all. Thankfully, those "Wicked Bacon, Turkish Coffee & Dark Chocolate" carry their name very well as they are indeed pornographically gorgeous and simply to die for. Those are Brownies with balls. They are soooooo bad! Recipe by Rosa @Rosa's Yummy Yums 2010. 1. Fry the bacon in a large skillet over medium heat until crispy. Remove with a slotted spoon to paper towels, and cool completely. Cut in small pieces. 2. Preheat the oven to 180° C (350˚F) and position a rack in the lower third of it. 3. Butter a 20 x 20cm (8inch) square baking pan and cover the bottom with parchement paper. 4. Place the chocolate and the butter in bain-marie bowl and place it in a pan of almost-simmering water. 5. Stir constantly until mixture is melted, smooth and warmish. Remove the bowl from the pan and set aside. 6. With a mixer, beat the eggs, sugar, salt and vanilla together on high speed until the mixture is thick and pale in color, about 2 minutes. 7. Whisk in the warm chocolate, then fold in the flour and the coffee. Whisk energetically in order to get a shiny, viscous and homogenous batter. Then mix in the bacon. 8. Scrape the batter into the greased and paper lined pan and spread the batter evenly. 9. Bake until a toothpick inserted in the center comes out clean, about 25 to 30 minutes. 10. Cool in the pan on a rack. 11. Once the brownies are cold, invert them on rack and peel off the paper. 12. Turn right side up on cutting board and cut into sixteen 5cm (2inch) squares. The original recipe didn't contain as much salt nor did it comprise bacon and coffee. You can make those brownies without those ingredients and with less salt (1/4 tsp), but don't forget to replace the coffee by the same amount of flour (1/3 Cup + 1Tbs). 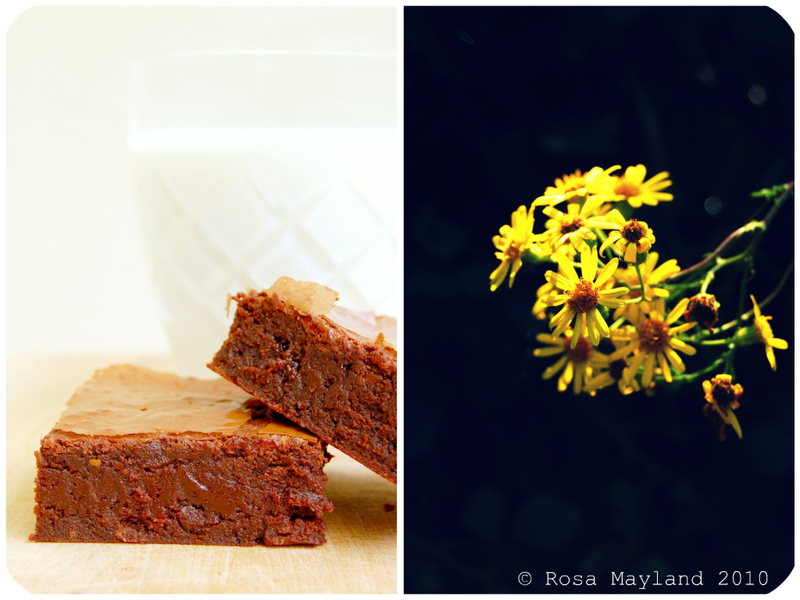 Eat those brownies whenever you need a chocolate fix and accompany them with a glass of very cold milk. Recette par Rosa @Rosa's Yummy Yums 2010. 1. Faire frire le bacon à température moyenne jusqu'à ce qu'il soit croquant. Le retirer de la poêle et le faire égoutter le bacon sur du papier ménage et le faire refroidir complètement avant de la couper en petits morceaux. 2. Placer la grille au tiers inférieur du four et le préchauffer à 180° C (350˚F). 3. Beurrer un moule carré à brownies de 20 x 20cm et recouvrir le fond de papier sulfurisé. 4. Mettre le chocolat dans un bain-marie et le placer au-dessus d'eau à peine frémissante. 5. Bien mélanger de manière constante jusqu'à ce que le tout soit fondu, lisse et chaud (pas trop tout de même). 6. Battre ensemble les oeufs, le sucre, le sel et la vanille avec un mixer pendant 2 minutes, jusqu'à ce que le mélange soit pâle et mousseux. 7. Incorporer le chocolat chaud au mélange oeufs/sucre et bien battre avec un fouet afin d'obtenir un mélange homogène. Ajouter la farine et le café. Bien battre afin que la pâte soit visqueuse, lisse et brillante. Ajouter le bacon et bien incorporer. 8. Verser la pâte dans le moule et bien lisser. 9. Cuire pendant 25 à 30 minutes, jusqu'à ce que le pointe d'un couteau inséré au milieu du brownie en resorte propre. 10. Faire refroidir sur une grille. 11. Une fois les brownies froids, les retourner sur une planche et enlever le papier sulfurisé. 12. Les retourner du bon côter et les couper en cubes de 5cm. La recette originale ne contient pas autant de sel, et ne contient pas de café ou de bacon. Vous pouvez confectionner ces brownies en utilisant moins de sel (1/4 CC) et n'oubliez surtout pas de remplacer le café par la même quantité de farine. Manger ces brownies à n'importe quelle heure de la journée ou de la nuit et consommer avec un bon vert de lait très froid. OMG! That brownie looks absolutely incredible! Oh Rosa! What a combination! You're killing me! Here's to wicked times! Your brownies look amazing! The Turkish coffee sound great with dark chocolate too. This recipe and blog-post was written beautifully. I really enjoy how you expressed yourself through your writing and I could not agree more with you, a delicious recipe! Mamma mia Rosa ! These really are truly A SIN !!! Should try subito ! Oh, my goodness those are sinful indeed! I would so love one right now! 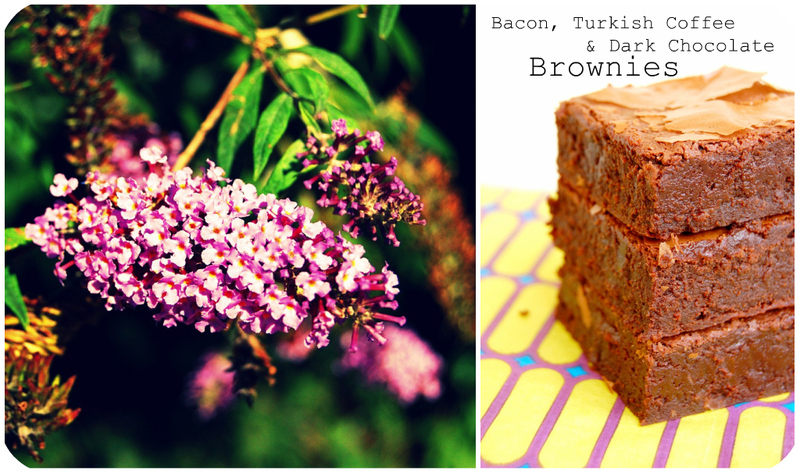 Beautiful brownies, although I am not sure about the bacon, I trust your judgement. They must be sinfully good. I'm with you~ eat healthy most of the time, then make your treats count! I have secretly been sneaking bacon and bacon grease into desserts for a while. The idea of it freaks some people out, but those are the same people who always ask for the recipe! so many of my favorite things in one dish! and the brownies look so thick and chewy but with the crackled crust on top - it looks absolutely sublime! Gorgeous browines!! I liked your coffee mug a lot!!! Oh goodness Rosa I'm salivating just reading this post! Those look very naughty indeed and just about irresistible! I think I'll have to try them ASAP! J'adore le brownie surtout pour sa belle croûte. a truly different taste combo. I got to note this down. What a great combo! Those brownies are to die for!!! Quelles belles photos envoûtantes de saveur!! this is definately the most good looking brownie I've ever seen. they are the perfect squares:) great post! Holy wow, you have outdone yourself! chocolate and bacon, very sinful combination! Wowow I am bookmarking this brownie recipe, they look absloutley so so yumm. I should look if i get turkish coffee other wise i will have to fo with the coffee i get here. This sounds so good! I just got some Himalayan pink salt, HimalaSalt, from Sustainable Sourcing https://secure.sustainablesourcing.com and I think I'll try it out in this recipe. Thanks for sharing! OUIouille ! irresistible ! C'est le mot adéquat ! Bon we Rosa ! j'adore la photo avec la tasse fumant !!!!!!!!!!! J'ai presqu'envie qu'il neige tiens ! même si je voulais, je ne pourrai pas y résister, la texture de ton brownie est trop belle! What a combination, Rosa. The brownies are to die for! I just adore the way you cut them up so nicely, so fudgy and so well cut! WOW! I love love love the brown crackly crust your brownies have! Too good, Rosa! Oooh they do like good Rosa. J'adore ton audace Rosa! Du bacon dans des brownies!!! J'avais déjà vu des biscuits beurre d'arachides-bacon, mais des brownies... J'aime bien être surprise en cuisine et avec ta recette, c'est réussi! Those look amazing! Great flavour combo! Bacon and coffee together? It's like a whole breakfast in one treat. wow do those sound intense! I haven't had a brownie in months, these look so good! Thanks Rosa for bringing me out of my box again! You naughty, naughty girl to tempt us so! And what indeed is life without a little indulgence, pleasure and something gooey, rich and decadent? And your pictures are fabulous! I am making brownies this weekend! Du bacon avec du chocolat? En tout cas la texture est superbe! 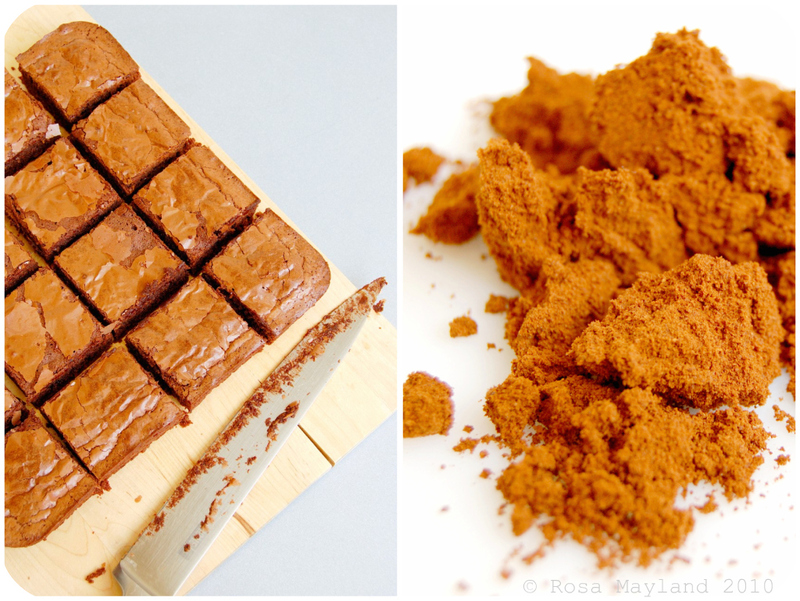 These brownies are crazy delicious looking, Rosa! They definitely look like they have the 'oomph' you mentioned. Que rico;)! Rosa, the brownies look delicious! I am always trying to find the perfect brownie recipe as the ones I have tried left me unsatisfied. I am not sure I will use bacon though, I am really chicken when it comes to bacon in sweets, just can't get my mind around the concept. Coffee, I will try it! Waw, Wickedly scrumptious indeed, Rosa!! These look amazing & so well flavoured with the bacon & the salt!! Very special too! Dark chocolate, bacon, Turkish coffee? WOW that sounds like an amazing combination! 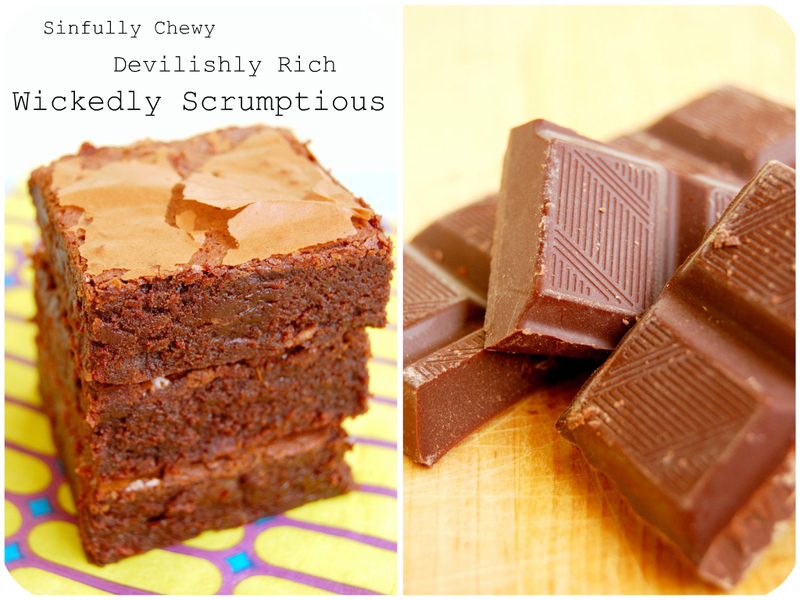 Your brownies look sinfully delicious! Ils sont ultra décadents tes brownies et ils ont l'air plus que délicieux! Comme toujours tes photographies sont magnifiques! 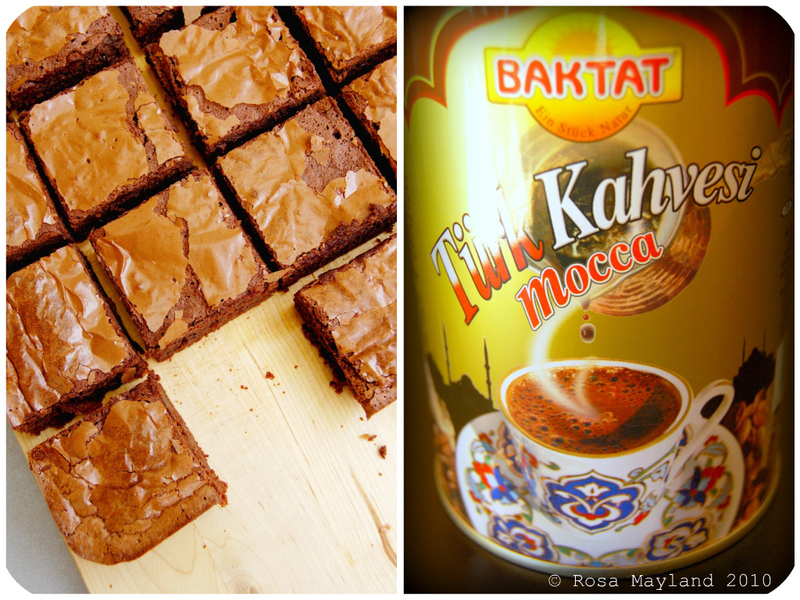 My husband wants to come to your house for brownies and a bit of Turkish coffee. These brownies are the epitome of decadence! I would love a taste, if nothing else, to find out how bacon and chocolate go together; actually I would eat them happily because they are made with the best ingredients. I have never seen vanilla paste. Interesting! Ha ha ha, hats off to you Rosa! Definitley agree the odd indulgence or three is definitely needed :) I actually feel less like eating "naughty" food if I know I'm allowed to have it (if that makes sense). Still working my way up to putting bacon in brownies, but these sound awesome! Fabulous job. Superbe mais étonnante association chocolat-bacon. Quoique finalement, plus rien n'est impossible en cuisine. On cuisine bien des viandes avec du chocolat !!! Je retiens et je pense que je l'essayerai par curiosité. Wow, Rosa that is such a daring combination to add bacon into your brownies but it also makes perfect sense! I would almost say that bacon makes almost everything taste good but I guess that is not entirely true..lol... In either case I love the addition of bacon here and I so want to try this out to taste it for myself! Rosa, bacon and chocolate...that's a wicked good combination! They look so darn moist and rich! Super-original recipe that I MUST try...! Um, wow! You manages to put my three favorite things together... bacon, chocolate, coffee. What more couls a girl want? These brownies look amazing! I have to make them! These look absolutely fantastic Rosa! Coffee and chocolate is such an amazing combo and I bet the bacon is incredible! These look SO amazing. Thanks for sharing. Pour avoir testé le cake chocolat au jambon fumé, je suis conquise par tes brownies. Beautiful site ..very nice..love the music addition also...enjoyed totally..thank you for sharing with us! My goodness! Bacon brownies! I would love to try these! That's such an interesting flavour combination! They look fantastic! Such inventive recipe...... you are so right about taking time to have indulgence in life. Delicious brownies...I fell for a chocolat fondant last night, not at all in the same class as your exquisite brownies...these are more for classy company, I had mine just at midnight..
Oh WOW Rosa. How gorgeous is this. It looks incredible> I cant wait to try it. I love bacon, chocolate and coffee. WOW WOW WOW! Coffee and chocolate is divine & I love the turkish coffee here. 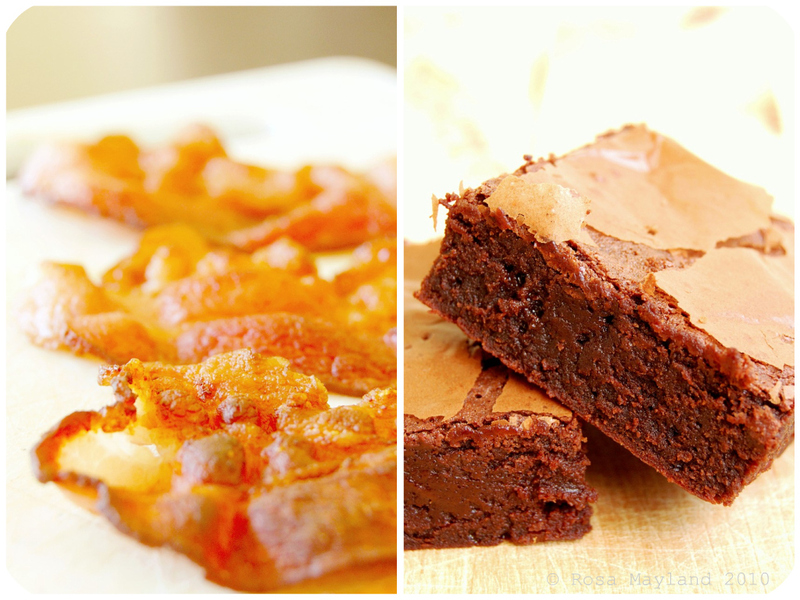 Bacon and brownies? Interesting, i'll have to try it soon :) i'm sure my dad would like it. Those brownies look wonderfully moist and delicious. Plus bacon? Yumm!